At Murphy Wealth, we not only invest for you, we invest in you. We take the time necessary to fully understand your financial goals and then customize a financial plan designed to help you pursue them. We’ll walk you step-by-step through the planning process and make sure you’re 100 percent comfortable with every aspect of the plan. We work hard to ensure that the results you achieve are in line with your expectations and risk temperament. We communicate regularly to keep you abreast of current economic conditions and any changes in policies that may affect your financial plan. Every decision we make is designed to help you work toward your financial and investment goals. Most important, our compensation is based on performance, not commissions, so our goals are always aligned with yours. 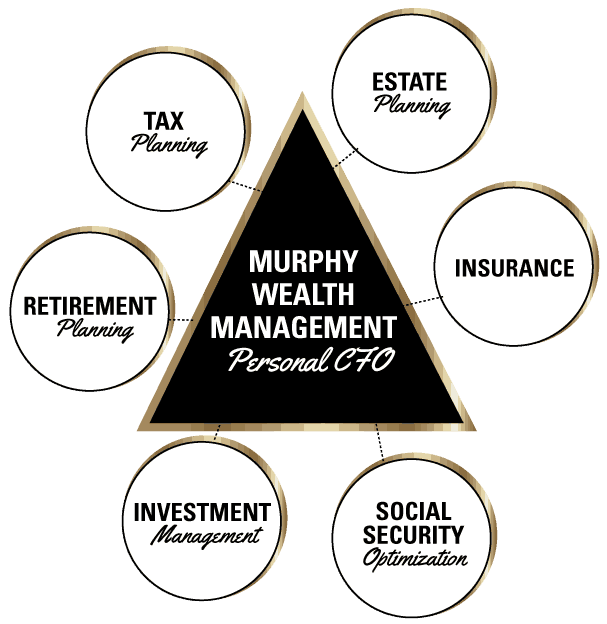 What really makes Murphy Wealth different from most financial services firms is that we take a holistic approach to your financial well-being. We realize that wealth management encompasses so much more than just investing money. There are many areas to consider when creating and implementing a wealth management plan. We create effective strategies that address all your needs, including tax planning, retirement, insurance needs, estate planning, and debt management. Our goal is to act as your personal “chief financial officer” (CFO). We connect all the professionals you will need on your team, including accountants, attorneys, and other advisors. Our one-stop shop approach means that everyone will be apprised of your goals and expectations. We’ve put together a team of professionals to support you in every aspect of your financial life. Isn’t that what you really want from your financial advisor?